The A300 was where it all began for the Airbus consortium and its failure would have been enough to see the new manufacturer breakup. As it was the initial production version the A300B2 (there had been 2 A300B1s made also), which entered service in May 1974 with Air France, was not a hot seller - only 59 were built. This was partly due to range performance issues and FAA rules which limited where twinjets could fly. The A300B4 became the primary initial version. Outwardly similar to the B2 it had an extra fuel tank giving it greater range. The creation of ETOPs rules expanded the opportunities for twinjet widebodies and Airbus was able to make several sales breakthroughs, even in the USA with Eastern Air Lines. A300B4 production ran to a creditable 188 units giving a full production run of 249 aircraft up till May 1984. The improved A300-600 (officially A300B4-600) used the rear fuselage and tail of the smaller A310 derivative increasing internal capacity. It also had upgraded engines and a two man cockpit. Along with the A310 the series 600, especially the longer range 600R, sold very well. Entering service with Saudia in 1983 313 were sold. Many A300s have since gone on to have long careers as freighters and the A300 fuselage has formed the basis of the later Airbus A330 and A340 family. The first A300 mould was made by Dragon Wings and as with most Dragon moulds at the time was reused by Jet-X (but only 4 times). Considering its age the mould is actually pretty decent and is Dragon's best Airbus mould by some distance. One of the best things about Dragon moulds is the lack of fuselage seams and the overall body shape of this mould, including the nose, is very good. As with all DW moulds the simple chunky undercarriage lets it down and the moulds biggest failing is that the engines almost scrape the ground. If you can get past that though its actually probably still the second best mould made, even in 2016. Dragon themselves kept on using the mould into 2008. Herpa created a new A300 mould and characteristically has only used it 5 times. Herpa produced Lufthansa delivery colours, Qatar Airways and DHL variants whilst Hogan made two models for the Japanese market in JAS and TDA markings. The lack of use is probably just as well because it is an ugly attempt at an A300. The body appears too chunky and the tail too small. Worse the nose is the wrong shape - rather than being symmetrical the lower half is more curved than the upper giving the radome a peculiar upturned look. On the plus side the mould has no seams and the engines are well clear of the ground. The second most prolific A300 mould arrived in 2006 and has been used jointly by the new Jet-X and Blue Box brands. It is however probably the second worst of the available moulds. 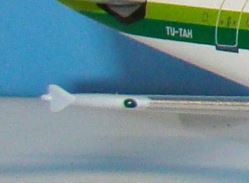 The nose is a bit pointy and again the fuselage looks chubby. This is made worse by the undercarriage being too short and the front gear shorter than the main it seems. There is also a huge seam around the engines which doesn't even try and blend into the natural lines of the body. Though this mould has been used a lot I can't recommend it at all. 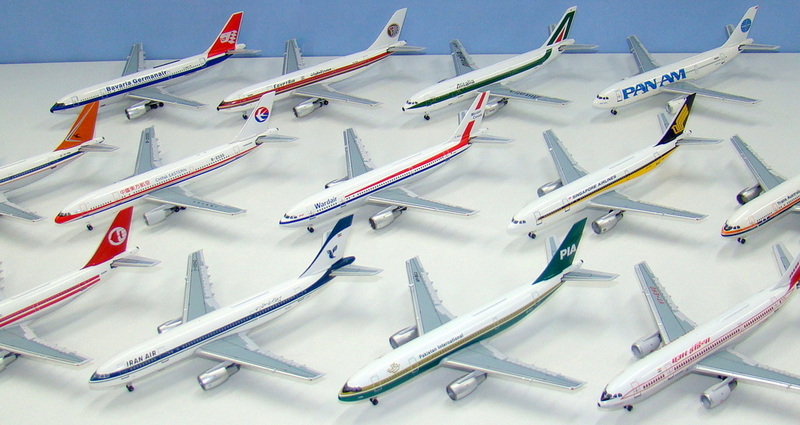 The first five models on this mould were Japanese examples made under the Big Bird brand but Aeroclassics have subsequently made the mould their own with a huge number of releases. The mould is superb - easily the best A300 even with the large wing seam - which at least follows the top of the wing unlike in the Jet-X. Everything else about the mould is excellent especially the detailed landing gear and perfect nose shape. You could argue the tyres are slightly too small but its a minor quibble. In my opinion if you are to buy an A300 this should be your first stop. Phoenix's mould is now 7 years old but they have used it only 18 times. From some angles the mould looks quite good and to its credit it has no wing root seam. The engines do appear a bit too small and the tyres a little large (the latter is a trait of many Phoenix models) but these are minor issues. The big issue with the mould is the nose shape which is simply awful. The nosecone isn't pointy enough and the slope down from the cockpit to the nose completely wrong. Another issue for the Phoenix mould are the wing fences on their series 600s. It can be seen from photos that they do not run to the end of the wing edge but on the Phoenix mould they appear too far along the wing edge. assymetrical and misshapen with little or no straight edges at the top and bottom. The Aeroclassics series 600 has better positioned and shaped fences. In 2014 Phoenix added antennae to the mould. The nose issue is a shame because otherwise the mould seems pretty good. For me it affects the appearance of the plane to such an extent I can't consider the mould. Thanks to Nathan Bennett for photos of his Qatar and Monarch A300s.